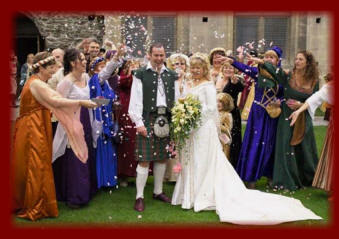 nce upon a time there was a fair maiden called Debbie, she had always dreamed of being a princess for the day but where would she find someone to help her have the ultimate medieval wedding day she dreamed of, she had finally met her true love, then she found The Kingdom of Fantaysia. 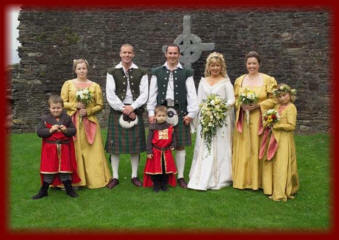 This dream indeed became a day never to forget as Magnificent Caerphilly Castle in Wales was to be the host for her day. Men at arms processed Princess Debbie over the magnificent portcullis and through to her awaiting true love. 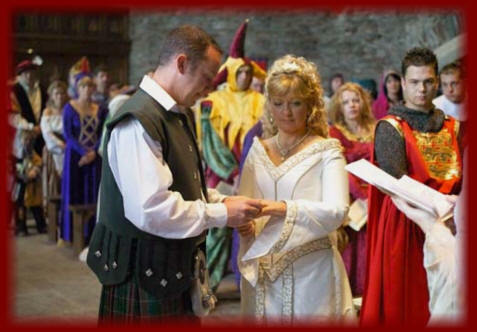 Their betrothal took place in the great hall of Caerphilly adorned with banners and all corners of the castle alight with candle light. 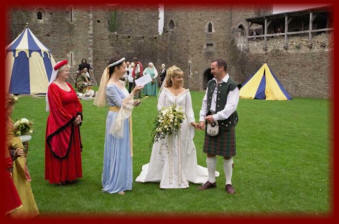 Both lovers then walked hand in hand to the court yard to enjoy an archery tournament with their guests whilst the Royal banquet was prepared by the Royal Caterers. 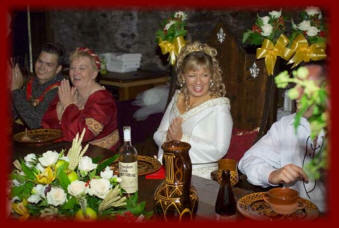 The banquet was then called and the wedding celebrations were to begin. It was then as Lady Debbie walked in she paid Princess Valaria the highest complement she had ever had pleasure to hear, Lady Debbie began to cry and said it had taken her breath away and how beautiful it all looked more than she imagined. With rules of the banquet, entertainment from the Royal Jester, Merlin the magician and the Royalist of Medieval Minstrels Nominus. Peasants were dragged before her for forgiveness for stealing at one point. Sword fighting ensued outside as entertainment for the guests. Platters of spit roast pork, barons of beef and honey glazed chicken were fetched forth dressed with edible flowers, for a banquet second to none. Reserve after reserve and an abundance of food was served by the Royal wenches. declared their undying love a fitting end to their day. Princess Valaria remembered the first conversation she had with Lady Debbie, "I want to be a Princess for the day, I want to have the whole medieval experience." So her wish was our command and the Kingdom set about commanding the armies from north south and west and all the Royal entertainers to ensure Lady Debbie felt like a real princess for her special day. Their day ended with Music from the Royal Minstrels and a ghost tour around the dark corridors of the castle led by Merlin by candle light. Braziers burnt outside & a fire show amazed the guests as the night came to and end.